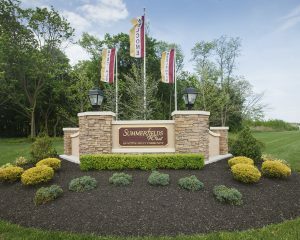 Distinctively designed, reasonably priced homes define Monroe Township’s newest 55+ community, Summerfields West. Planned for 415 homes on approximately 110 acres, Summerfields West is situated in the heart of the New Jersey Pinelands. Rustic walking paths and shaded tree-lined streets create a friendly hometown atmosphere. 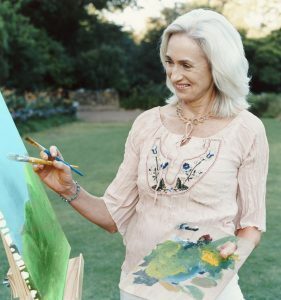 Boasting five innovative models comprised of two or three bedrooms, space-enhancing living and dining rooms, and low maintenance exteriors, Summerfields West is your new direction for 55+ lifestyles. These Exceptional residences are close to the exciting nightlife of Atlantic City’s casinos and to Philadelphia’s fine restaurants, museums and sporting events. Along with all that the area has to offer, the unmatched home values and comfortable lifestyle at Summerfields West make easy living in an attractive environment simply irresistible. The Temple Companies, a trusted, award winning developer of quality home communities since 1955, has devoted its expertise to developing and managing this professionally designed community. 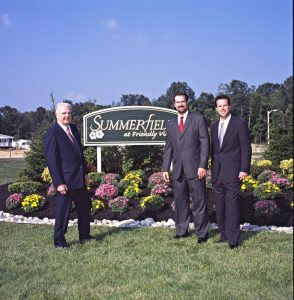 Homeowners at Summerfields West enjoy a comfortable, carefree way of living that only a developer like The Temple Companies—a family owned and operated enterprise—are capable of creating. Like all of our more than 38 manufactured home neighborhoods and 10,000-plus home sites on both the east and west coasts, The Temple Companies takes a consumer-focused and quality-driven approach to provide Summerfields West homeowners with the ultimate in overall satisfaction, customer service and community management policies culminating in the long-term lifestyle benefits and remarkable value our homeowners have come to expect. 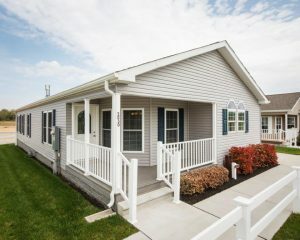 Realizing the importance of research, new building techniques and how to site-specifically apply them to each community has allowed The Temple Companies to offer homebuyers innovative designs, life-enhancing floor plans and preferred customization opportunities. Equally important, is the alluring curb appeal enriched by carefully planned streetscapes highlighted with an abundance of indigenous trees and other natural vegetation. Thanks to decades of experience developing thriving communities in prime locations—along with an unbending commitment to excellence—The Temple Companies have earned a reputation among the building industry and homeowners alike that is truly second to none. When you choose Summerfields West, you will quickly discover why so many savvy, value-conscious active adults have put their trust in The Temple Companies. Affordability at Your Doorstep… Owning a Home on a Leased Homesite. We at The Temple Companies long ago recognized the demand for private land lease communities comprised of low-maintenance manufactured homes and have acted upon this housing market phenomenon insightfully…and aggressively. Over the years, the visual characteristics, floor plan functionality and durability of these homes—together with desirable locations and onsite activity facilities —have continued to improve and even exceed the standards of traditional houses while providing extraordinary cost savings in a worry-free living environment. The land lease concept is simple: Rather than purchase a building lot and incur its often exorbitant pre-construction costs, the homeowner instead leases the property and buys the home to occupy it, choosing from the variety of home styles available at Summerfields West. Further enhancing the savings, traditional property taxes on the home site are replaced by a comfortably affordable monthly land lease fee. Meanwhile, the homeowner retains the right to the lease and the option to sell the home to anyone and at any time, as long as the new buyer complies with the community’s designated age-restriction regulations and financial qualifications. Further, since the lease fee is tied to the inflation rate, homeowners can remain confident that their lease costs will never exceed cost of living variations. The considerable savings homeowners enjoy at land lease communities may be used for any other purpose that the homeowner chooses, such as investments, travel or as funding the purchase of their new home at Summerfields West. Distinctively designed, reasonably priced homes define Monroe Township’s community is situated on approximately 50 acres in the heart of the New Jersey Pinelands. Rustic walking paths and shaded tree-lines streets create a friendly hometown atmosphere. Boasting five innovative models comprised of two or three bedrooms, space-enhancing living and dining rooms, and low maintenance exteriors, Summerfields West is your new direction for 55+ lifestyles. These exceptional residences are close to the exciting nightlife of Atlantic City’s casinos and to Philadelphia’s fine restaurants, museums and sporting events. Along with all that the area has to offer, the unmatched home values and comfortable lifestyle at Summerfields West make way living in an attractive environment simply irresistible. The Temple Companies, a trusted, award-winning developer of quality home communities since 1955, has devoted its expertise to developing and managing this professionally designed community.